Chimney repointing is a process that can add years to your chimney life. The process is specifically used as a reasonable alternative for repairing mortar joints by grinding out the damaged cement then filling the area with new mortar mix. The newly mixed mortar is filled into the cracks and helps in preventing water from entering between the bricks. This creates a durable and long-lasting existence for your chimney structure. This process is commonly called tuck pointing. Does Chimney Repointing Fix My Chimney? Often chimneys are in need of more repair than tuck pointing alone. If you see a lean, a bend, or broken or loose bricks on your chimney, chimney repointing may not be the solution to your problem. The best way to handle this is to have either a partial or full chimney rebuild. 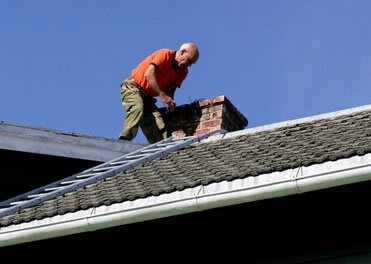 If you see missing or loose cement, then having your chimney repointed may be the way to go. We would recommend having an expert evaluate why the mortar is loose or missing in the first place. What type of mortar will the mason or chimney repair person use? There are different mortar types such as Masons Mix, Type N, Type S, Type M and others. Be sure your contractor chooses the correct one for your masonry project. If done correctly chimney repointing can add years of life to your chimney. Creative Masonry & Chimney offers our customers really affordable pricing for chimney repointing services. Since every job is different, we recommend our potential customers give us a call to discuss your CT chimney repair project. Our Chimney repointing experts will be able to give you an estimated cost right over the phone. If you like our price, we can schedule an onsite visit. Click here to schedule a free consultation now!